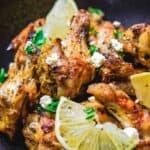 Easy Baked Chicken Wings Recipe; prepared Greek-style with garlic, olive oil, lemon juice and oregano. Finished with a little feta cheese and fresh parsley and served with a classic Greek Tzatziki sauce. To say that I just served these baked Greek chicken wings to a hungry party crowd would be a lie. Truth is, it was an uneventful night. I was testing my wings recipe, and my little family provided support by taste-testing inhaling them! 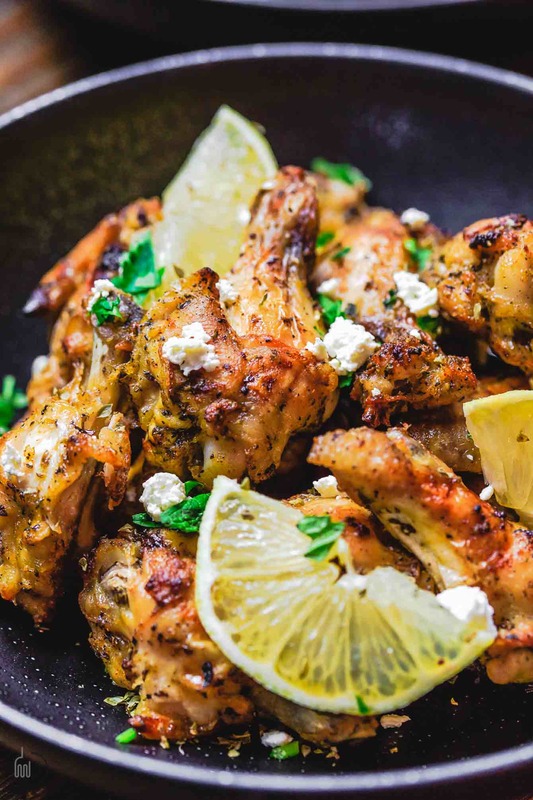 You can count on this, the next time we host a gathering of any kind, these Greek chicken wings will be on the menu! 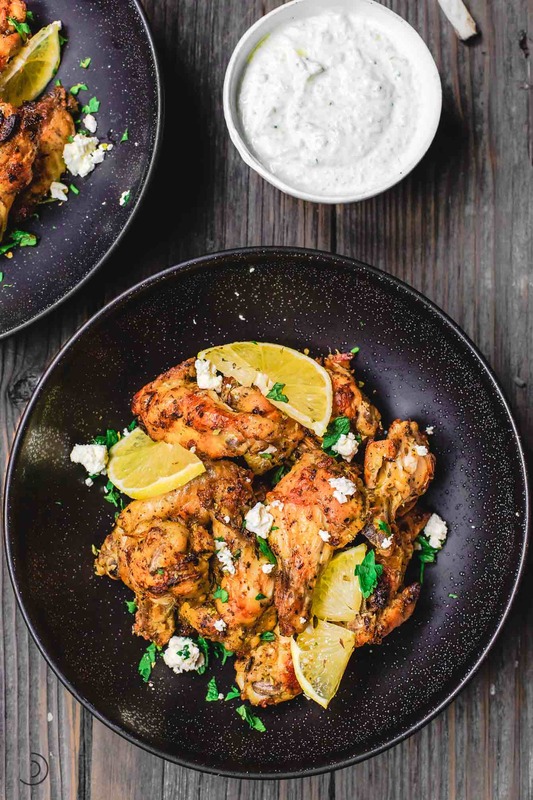 As the title indicates, this baked chicken wings recipe is a simple Greek twist on the beloved classic. The key is in the marinade–olive oil, lots of citrus, garlic, and a few spices, including a generous amount of oregano. I like to bake these Greek chicken wings until they are nice and crispy. 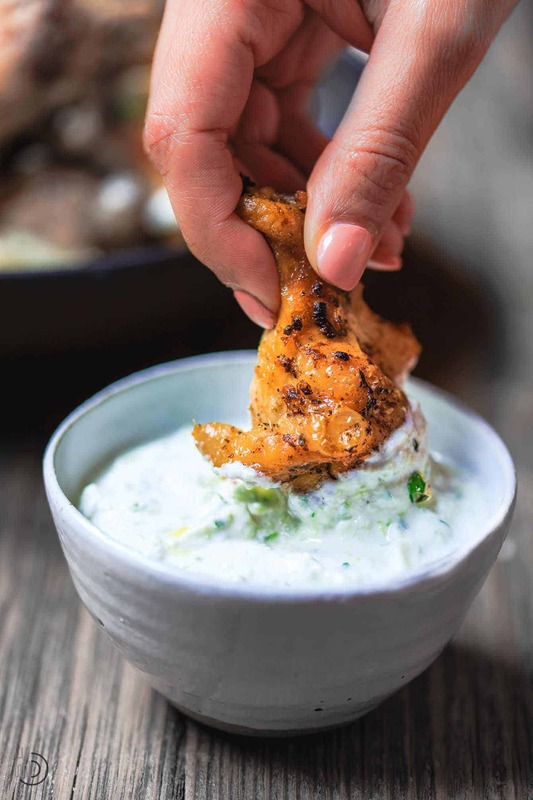 A side of Greek Tzatziki (yogurt and cucumber sauce) is all you need next to these wings! Make the marinade a couple of hours and up to one day ahead of time. Whisk together the olive oil, lemon juice and zest, and the remaining marinade ingredients (only add the cayenne if you want spicy wings). Now add the chicken wings and toss to coat the wings evenly. Cover and refrigerate for a couple of hours or overnight. Preheat the oven to 375 degrees F. Spread the chicken wings on a large baking sheet and bake in the heated oven for 45-50 minutes. Move the chicken wings to the top rack and broil briefly until the skin turns golden brown and crispy. Remove from heat when ready (internal temperature should register at least 165 degrees F). While the chicken wings are baking, make the Tzatziki sauce according to this recipe. Transfer to a serving bowl, and cover the sauce and refrigerate until ready for use (just give the sauce a little stir just before serving). Transfer the chicken wings to a serving bowl or platter. Garnish with feta cheese, lemon slices, and a generous sprinkle of fresh parsley. Serve with the Greek Tzatziki sauce. Enjoy! Cooking Tips: Marinade should be made a couple of hours to one day ahead of time. Wings should be marinated for a couple of hours or overnight. Recommended for this Recipe: Our Private Reserve Greek extra virgin olive oil (from organically grown and processed Koroneiki olives!) and all-natural sweet paprika. SAVE! Try our Greek olive oil bundle! Ultimate Mediterranean Spice Bundle, or create your own 6-pack or 3-pack or our all-natural or organic spices. Awesome, Melanie! So glad you enjoyed these wings! I made this last night for dinner, and I’m definitely adding this recipe to my regulars. It is so flavorful and we definitely loved it! Awesome Celste! Thanks for sharing! hi ,it looks like this tzaztziki sauce, is a favorite dipping sauce for many food recipes i have come across. Great recipe and so easy! My picky kids request this dish once a week! That’s awesome, Laura! So glad your kids enjoyed it!!! Fantastic recipe! My wife and I loved it! Wonderful, Casey! So glad you enjoyed it! This was really very yummy. My husband loved it too.I followed the recipe putting the exact amounts of ingredients suggested, and the balance of flavours was just right.I also made the tzaziki sauce which I hadn’t done before and it complemented the chicken nicely. Thank you. Great, Jenny! I am so glad y’all enjoyed these wings. They’re a family favorite over here too. Absolutely! Feel free to adjust the garlic to your needs 🙂 You can also use a bit of garlic powder, if you prefer that over fresh garlic. But remember, the garlic is only in the marinade, it’s tamed by the olive oil and lemon juice. Enjoy! I did make these wings and they were awesome!! My family enjoyed them very much. Great recipe! Wonderful, Susan! So glad you enjoyed these wings! Thank you for giving them a try! Is there a link on your site to see the nutritional information. Merci. Hi Suzy, not currently. I don’t have the ability to provide nutritional information at this point. But there are several apps out there where you can plug in the recipe ingredients and get the nutritional information. Awesome, Renee! Good to see you here again. Your chicken recipes look so amazingly delicious and very simple to make. Thank you, Carlos! So appreciate your kind comments. I am looking forward To making these and rating them. Thank you for sharing! Oh, MY. The hubs is an absolute wing ADDICT, but I get tired of the same old deep-fried version. This sounds like a delicious, healthy alternative! Oh it really is, Michelle! Hope you give it a try. Oh, you need no big event to make these wings! I hope you give them a try soon! These would be promptly inhaled in my house, too (by me)! 😉 I definitely need to give these a try sooner rather than later. I want to tzatziki all the things! Haha! Awesome, Heather! Hope you give these a try! Oh boy! These sound bad to the bone! I love the Greek style wing recipe and sauce!!! Thank you, Dan! Glad these won your favor! They are super simple, Jo! Thanks so much for checking the recipe out.